Low-top leather sneakers in white featuring text printed and embroidered in black throughout. Round toe. Lace-up closure in ‘total’ orange. Logo flag featuring signature ‘Swoosh’ and text in ‘total’ orange at padded tongue. Padded collar with ‘total’ orange eyelet vents. 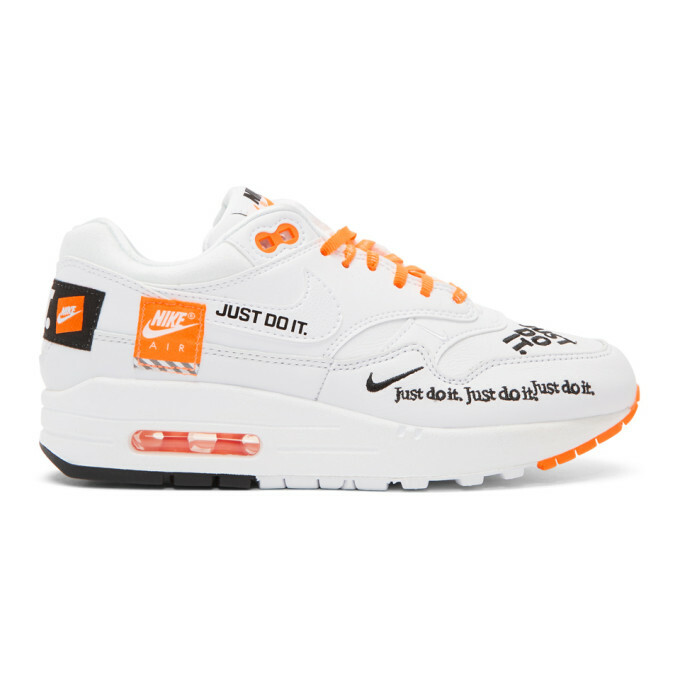 Signature ‘Swoosh’ in white and logo patch in ‘total’ orange at outer side. Detachable tonal rubber logo flag at single outer side. Lenticular signature ‘swoosh’ with logo patch in ‘total’ orange at inner side. Sculpted rubber midsole in white featuring signature transparent Air sole unit. Treaded rubber outsole in white, black, and ‘total’ orange. Tonal stitching.Please note that this product can only be shipped within Canada.